Brown Palace Hotel is the oldest hotel located in Denver, Colorado. It was built and owned by Henry Brown and guests included and still include many entrepreneurs, legislators, presidents and foreign officials. There is a rumor that a crematorium exist in the basement. Civic Center is a neighborhood and park in Denver, CO. The area is known as the center of the civic life in the city, with numerous institutions of arts, government, and culture as well as numerous festivals, parades, and protests throughout the year. The park is home to numerous fountains, statues, and formal gardens, and includes a greek amphitheater, a war memorial, and the Voorhees Memorial Seal Pond. It is well-known for its symmetrical Neoclassical design. Civic Center is also well-known for its large homeless population and problems with crime. Ironically, a lot of open-air drug-dealing occurs in the eastern grove area within sight of the lawmakers at the city and state government buildings. Recently, the city officials have proposed changes to make the area more accessible to the downtown population in the north and the museums towards the south. Some of these changes include adding newer pedestrian crossings, bus areas and kiosks. One proposal would even put Colfax Avenue underground with a pedestrian plaza on top of the former street. Two new buildings planned for the Civic Center are the Denver Newspaper Agency (northeast of the park), the future home to the Denver Post and the Rocky Mountain News and the new Denver Justice Center, two blocks away from Civic Center Park. These new buildings will change the dynamic of the area with some people worrying that the architecture of the two buildings, especially the Justice Center, (which will have the city jail) will disrupt the historic design of the park. Denver hopes to alleviate these concerns by incorporating the buildings into the future Civic Center plan. The Colorado State Capitol Building, located in Denver, Colorado, is the home of the Colorado legislature. The building is intentionally reminiscent of the United States Capitol. It was constructed in the 1890s from Colorado white granite. The distinctive gold dome consists of a plate of real gold, first added in 1908, commemorating the Colorado Gold Rush. The main entrance hall is open 180 feet (55 meters) to the top of the dome, about the height of an 18-story building. The interior of the building uses copious amounts of a rare rose marble from a quarry near Marble, Colorado. Confluence Park is a park encompassing the intersection of Cherry Creek and the South Platte River in Denver's Lower Downtown (LoDo), a bustling neighborhood of 19th-century brick warehouses and storefronts that has been redeveloped since the late 1980s into one of Denver's most vibrant and active regions. The park includes cement trails often filled with walkers, runners, and bikers. Some grassy areas, river overlooks, and park benches are also available. One pedestrian bridge (soon two--as of May 2004) crosses the South Platte River at Confluence Park. The eastern edge of the South Platte in Confluence Park has been transformed into a kayak run, immediately across from Recreational Equipment Incorporated's (REI) Colorado flagship store. The park is adjacent to a number of new up-scale townhouses, apartments, and loft developments, another park bordering the South Platte downstream, train tracks, and Denver's skatepark. 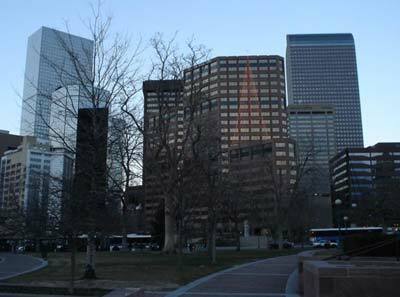 The Daniels & Fisher (D&F) Tower is a distinctive Denver, Colorado landmark. Built as part of the Daniels & Fisher department store in 1910, it was the tallest structure west of the Mississippi at the time. A clock tower, it has clock faces on all four sides. Daniels & Fisher were later bought out by the May Company, and in the 1950s and 60s it was known as the May D&F building. When the building was demolished (ca. 1980), the tower was saved. It stands today in downtown Denver. The Denver Art Museum is an art museum in Denver, Colorado. It is known for its collection of American Indian art, and has a comprehensive collection of world art with a total of more than 55,000 works of art. The museum was founded in 1893. It is housed in a 28-sided building designed by Gio Ponti. A major expansion, the Frederic C. Hamilton building, designed by Daniel Libeskind is under construction and expected to open in 2006. The museum is run by a non-profit organization separate from the city of Denver. Major funding for the museum is provided by a 0.1% sales tax levied in the Science and Cultural Facilities District, which includes seven Colorado counties in the Denver metropolitan area. About 60% of this tax is used to provide funding for the Denver Art Museum and three other major science and cultural facilities in Denver (the Denver Botanic Gardens, the Denver Zoo, and the Denver Museum of Nature and Science). The Denver Botanic Gardens 23 acres (93,000 m²) has been recognized as one of the top five botanical gardens in the United States. The main garden is located at 1005 York Street, Denver, Colorado, with satellite gardens at Chatfield 750 acres (3 km²) in Littleton, Colorado and Mt. Goliath, as well as the Centennial Gardens 5 acres (20,000 m²) also in Denver. The Gardens contain more than 32,000 plants from Australia, Africa, and the Himalayas. Specific garden areas include: the Birds and Bees Walk, Boettcher Conservatory, Children’s Secret Path, Cloud Forest Tree, Japanese Garden, June's PlantAsia, Mile High Garden, Monet Garden, O’Fallon Perennial Walk, Rock Alpine Garden, Romantic Gardens, Sacred Earth, Sensory Garden, Water Gardens, and the Water-Smart Garden. Denver Mint A branch of the United States Mint established in 1906 that produces coins with a D mint mark (not to be confused with the mint in Dahlonega, Georgia). The Denver Mint still operates today and produces coins for circulation, mint sets, and commemoratives. A performing arts complex located in Denver. It is the second largest performing arts center in the US after New York City's Lincoln Center. The complex houses the following performance spaces: Auditorium Theatre- Historic theatre that was home to the 1908 Democratic presidential convention, Boetcher Concert Hall- Home of the Colorado Symphony Orchestra, Bonfills Theatre Complex- Home of Stage, Space, Ricketson, and Jones Theaters as well as the Grand Ballroom, Buell Theatre, Galleria Theatre. The Molly Brown House Museum was the home of Margaret Brown, known as "The Unsinkable Molly Brown" because she survived the sinking of the RMS Titanic. The museum in Denver, Colorado presents exhibits interpreting her life and that of Victorian Denver as well as architectural preservation. It was built in the 1880s by William Lang, incorporating several popular styles of the period, including Queen Anne, for the original owners Isaac and Mary Large. They suffered from the crash resulting from the repeal of the Sherman Silver Purchase Act in 1893 and were forced to sell the house. It was purchased by James Joseph Brown (J.J.), Margaret's husband, in 1894 for $30,000 U.S. and the title was transferred to Margaret in 1898, possibly due to J.J.'s deteriorating health. Colorado's Ocean Journey was the largest aquarium between Chicago and California. Covering 17 acres it was located at 700 Water street, Denver. Founded by Bll Fleming and Judy Petersen Fleming and partially funded by a $57 million dollar bond loan as well as loans by the department of Housing and Urban Development. The total cost was $93 million. Early on skeptics questioned the neccessity of an expansive Aquarium exhibit in a landlocked state. This view was seemingly born out by low attendence numbers following its opening June 21st 1999. Colorado Ocean Journey Liquidation Inc. filed bankruptcy April of 2002 and the building was purchased in by Landry's Restaurants, Inc. for $13.6 million with plans to reopen it as the Downtown Aquarium in Denver. Red Rocks is a mountain park to the southwest of Denver, where very large, dark red boulders seem to sprout from the earth. One of these, Ship Rock, is the size and approximate shape of a large ship, but balanced on another boulder so delicately that it sways and rocks back and forth in a moderate wind. Within the park boundaries is the Red Rocks Amphitheatre. Nearby (South 17.7 miles) is Roxborough State Park, with red-rock formations. Further south is Garden of the Gods. Also nearby (South 4.21 miles) is Willowbrook Amphitheatre. Six Flags Elitch Gardens is an amusement park in Denver, Colorado. It is a member of the Six Flags chain. Elitch Gardens was a family owned amusement park at a different location in Denver (38th and Tennyson) known for its lush landscaping, theater, and wooden roller coaster named Mr. Twister. In 1994-1995 the original Elitch Gardens relocated to a new location in Denver and was subsequently sold to the Six Flags chain. Twister II is a new wooden roller coaster based on the original Mr. Twister. The new park has a water park as well as over 45 rides, shows, and attractions. The Tattered Cover Bookstore is a bookstore in Denver, Colorado, and one of the largest independent bookstores in the United States. Its main location is in the Cherry Creek district of Denver with another branch in Denver's LoDo (lower downtown) district. In November, 2004, the store opened a third location in Highlands Ranch, Colorado. The Tattered Cover is open 7 days a week, hosts prominent book signings, and is renowned for its customer service. The inventory for its retail sales is over ½ million books. The store was founded by Joyce Meskis. Like many independent bookstores, the Tattered Cover is a member of the American Booksellers Association. Union Station is Denver, Colorado, USA's historic train station at 17th and Wynkoop in Denver's LoDo district. The station first opened in 1881. After the original structure was destroyed by fire in 1894 it was rebuilt in Beaux-arts style and still serves passenger traffic including: Amtrak's California Zephyr, Denver & Rio Grande Western Railroad's Ski Train, providing service between Denver and the Winter Park Ski Resort. The Wells Fargo Center, formerly known as Norwest Center, is the third-tallest building in Minneapolis, Minnesota after 225 South Sixth and the IDS Center tower. Completed in 1988, it is 773 feet (235.6 m) tall. For many years, this was believed to be one foot shorter than 225 South Sixth, but that structure actually had a different height (see the IDS Center article for details). Norwest Center was designed with a modernized art deco style by Cesar Pelli, reflecting nearby structures such as the nearby Qwest Building and the Foshay Tower, which is several blocks away. It is also considered by many to be an homage to the GE Building at New York City's Rockefeller Center. Wells Fargo Center sits on the site of the old Northwestern National Bank Building, which was destroyed in a fire in 1982. Norwest Bank was the original lessee, and Wells Fargo still has regional offices there (Norwest, one of the most acquisitive banks of the 1990s, actually bought Wells Fargo in 1998, later changing the company name and moving their headquarters San Francisco, California where Wells Fargo had been based).